Chances are that if you are a heavy metal fan that you own albums from at least a few of the bands that were considered to be a part of the New Wave of British Heavy Metal. The scene ended up being monumental for the development of the genre as a whole and a lot of the earlier acts took their influence from the British punk scene at the time. 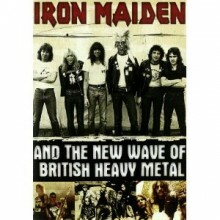 These roots are explored on the documentary Iron Maiden and the New Wave of British Heavy Metal, which showcases quite a few of the bands that were a part of the flourishing heavy metal scene while focusing on Iron Maiden throughout. And if you like groups such as Saxon, Diamond Head, and Praying Mantis in addition to Maiden this DVD is sure to grab and maintain your interest for its entirety. I have to wonder if this documentary was given the title Iron Maiden and the New Wave of British Heavy Metal in order to try and sway people to pick it up simply because they are fans of the group. But although Iron Maiden is the focal point throughout the documentary, there are no interviews with current members of the band. What this documentary does offer though is footage and interviews from a variety of different bands and other people that had been involved in the scene in various ways. This nearly two and a half hour film starts off by looking at the early rock and punk movements that would go on to inspire the British heavy metal acts that formed in the mid 70’s, and then chronicles many of these group’s journey through the scene. In addition to Iron Maiden, the film makers also give quite a bit of scream time to Saxon and Samson, and they managed to include quite a bit of video footage from each act. However, some viewers may be disappointed that certain bands are given interview segments but none of their music is played. This is true of the segments in which Diamond Head is featured, but this could simply be a case where the creators didn’t have a big enough budget to include everything. But the interviews themselves are very educational and reveal a lot about the overall scene and the individual bands, which does make it worth a watch. Although this documentary has Iron Maiden its title, if you are looking for a comprehensive history on the band you will come away disappointed. But taken as a history lesson on the British heavy metal scene as a whole that gives a general overview to many of the big players this is a documentary that really hit’s the mark and chances are you will learn something about at least a few of these bands that you didn’t know before. This DVD is not an essential purchase, but if you live and breathe this genre it is worth checking out at least once.